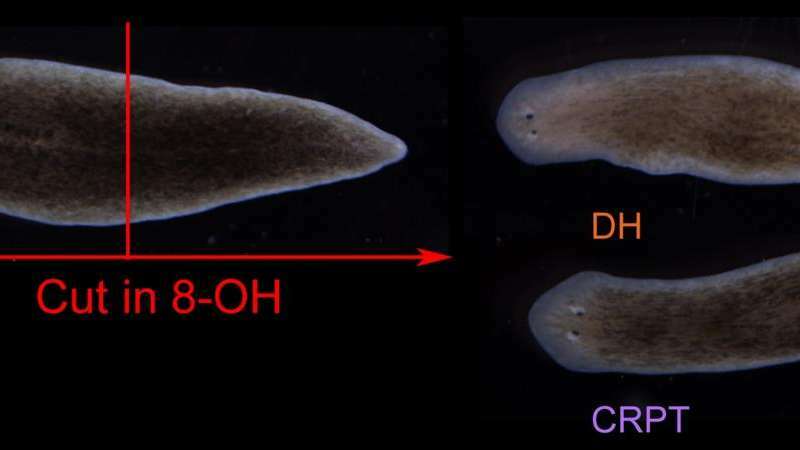 Researchers have succeeded in permanently rewriting flatworms' regenerative body shape by resetting their internal bioelectric pattern memory, causing even normal-appearing flatworms to harbor the "code" to regenerate as two-headed worms. The findings, published today in Biophysical Journal, suggest an alternative to genomic editing for large-scale regenerative control, according to the authors. The research, led by scientists at Tufts University's Allen Discovery Center and its Department of Biology, addresses the forces that determine the shape to which an animal's body regenerates when severely damaged, shows that it is possible to permanently alter the target morphology of an animal with a wild-type genomic sequence, and reveals that alternative body patterns can be encoded within animals with normal anatomy and histology. The research also provides clues about why certain individuals have different biological outcomes when exposed to the same treatment as others in their group. "With this work, we now know that bioelectric properties can permanently override the default body shape called for by a genome, that regenerative target morphology can be edited to diverge from the current anatomy, and that bioelectric networks can be a control point for investigating cryptic, previously-unobservable phenotypes," said the paper's corresponding author, Michael Levin, Ph.D., Vannevar Bush professor of biology and director of the Allen Discovery Center at Tufts and the Tufts Center for Regenerative and Developmental Biology. The findings are important because advances in regenerative medicine require an understanding of the mechanisms by which some organisms repair damage to their bodies, said Levin. "Bioelectricity has a powerful instructive role as a mediator in the reprogramming of anatomical structure, with many implications for understanding the evolution of form and the path to regenerative therapies," he added. Researchers worked with planaria (Dugesia japonica)—flatworms that are known for their regenerative capacity. When cut into pieces, each fragment of flatworm regenerates what it is missing to complete its anatomy. Normally, regeneration produces an exact copy of the original, standard worm. Building on previous work in which Levin and colleagues demonstrated it was possible to cause flatworms to grow heads and brains of another species of flatworm by altering their bioelectric circuits, the researchers briefly interrupted the flatworms' bioelectric networks. They did so by using octanol (8 OH) to temporarily interrupt gap junctions, which are protein channels—electrical synapses—that enable cells to communicate with each other locally and by forming networks across long distances, passing electrical signals back and forth. Twenty five percent of the amputated trunk fragments regenerated into two-headed flatworms, while 72 percent regenerated into normal-appearing, one-headed worms; approximately 3 percent of the trunk fragments did not develop properly. At first, the researchers assumed that the single-headed treated flatworms had not been affected by the treatment, as is common when the function of a biological system is altered by any experimental treatment or environmental event. However, when the flatworms with normal body shape were then amputated repeatedly over several months in normal spring water, they produced the same ratio of two-headed worms to one-headed worms. The flatworms' pattern memory had been altered, although this was not apparent in their intact state and was revealed only upon regeneration. The research showed that the altered target morphology—the shape to which the worms regenerate upon damage—was encoded not in their histology, molecular marker expression, or stem cell distribution, but rather in a bioelectric pattern that instructs one of two possible anatomical outcomes after subsequent damage. "The altered regenerative body plan is stored in the bioelectric networks in the cells of seemingly normal planaria, and the body-wide bioelectric gradients serve as a kind of pattern memory," said Fallon Durant, the paper's first author and a Ph.D. student in the Integrative Graduate Education and Research Traineeship (IGERT) program at the Department of Biology and the Allen Discovery Center at Tufts University. "Bioelectric signals can act as a switch that not only can change body plan anatomy but also undo those changes when reversed." I wonder what researchers will learn about how the increasingly personal electric fields of wearable devices affect tissue development and function. Watches interacting with repetitively stressed joints, glasses and headsets interacting with sensory organs, neurons and the brain.